It shipped with a ‘Photo Frame 2’ dock, which was a multitasking charger/image transfer/snazzy camera display. The charging feature was especially useful, since the V570’s battery was only rated to 150 shots per charge – pretty bad even by 2006 standards. We didn’t review the V570, but then friend-of-DPR and current DPR staffer Jeff Keller wrote about it on DCResource. 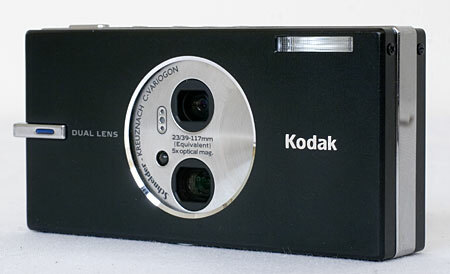 He disliked that Kodak advertised the camera as having a 5x zoom lens, when it was really just a wide angle prime and a 3x zoom that you could switch between. Still, it was the first dual-lens implementation we can remember, and even though it didn’t catch on with camera manufacturers, the concept has found new life in smartphones like the iPhone 7 Plus.